Where is Bhadra Fort located? Our country is enriched with rich history of heritage and culture. So many kings ruled India in the northern and southern parts with their established empires. During their period several forts and palaces were built. 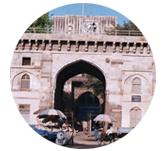 Among those Bhadra Fort is one monument which is situated in city area of Ahmedabad. It is embellished with several palaces, mosques, temples and other structures that are built inside the fort. This fort was built by Ahmad Shah due to which the city was named under his name Ahmedabad. This tutorial will give you the information about the Bhadra Fort and also the structures that have been built inside the fort. This tutorial is for those people who are very much interested in knowing about the history of Bhadra Fort with its architectural designs and structures of the monument. Many people visited this fort from India and abroad. This content which is provided by this tutorial is designed only for informational purpose. To know the information there are no prerequisites required. You should have more interest in visiting new places and experience their beauty. How To Reach Bhadra Fort?